Mozzarella, pepperoni and pizza sauce are enveloped in refrigerated pizza crusts baked to a golden crisp in this family-pleasing calzone. Unroll 1 pizza crust onto greased baking sheet; pat to 12x10-inch rectangle. 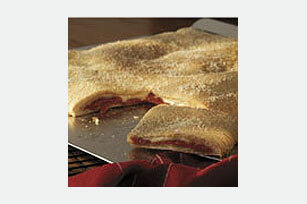 Spread with pizza sauce to within 1 inch of edges; top with half the mozzarella, pepperoni and remaining mozzarella. Reserve 1 Tbsp. Parmesan; sprinkle remaining Parmesan over mozzarella. Cover with second pizza crust; crimp edges with fork to seal. Sprinkle with reserved Parmesan. Bake 25 to 30 min. or until evenly browned. Let stand 5 min. before cutting to serve. Substitute chopped fresh vegetables, such as green peppers, red peppers, broccoli or onions, for the pepperoni. Serve with additional heated pizza sauce.